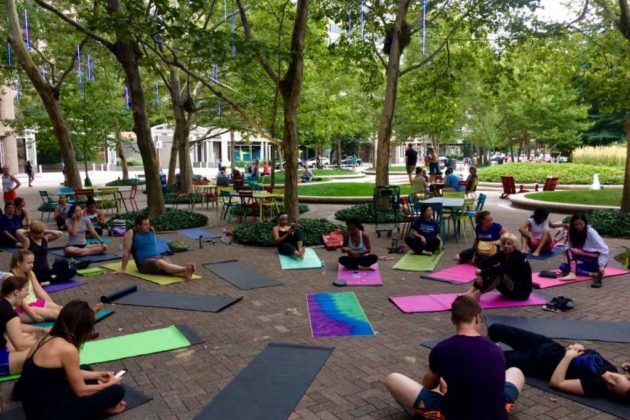 Another free weekly yoga event has begun in Crystal City. 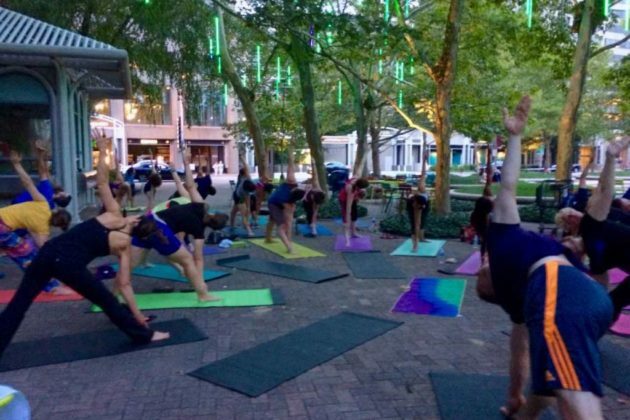 The new program, “Yoga at the Fountain,” will be held at the Crystal City Water Park (1751 Crystal Drive) each Sunday night from 7:30-8:45 p.m. through the end of September, according to Amanda Shipe, one of its organizers. The first event was held this past Sunday. 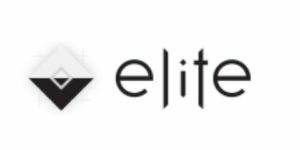 The event is sponsored by the Crystal City BID and the weekly classes are led by instructors from Mind Your Body Oasis, a holistic wellness center and yoga studio based in Crystal City. The BID and Mind Your Body Oasis have been hosting a similar event, “Monday Morning Yoga,” at the water park from 7-8 a.m. for six years. Attendance has grown tremendously since the event first began, according to Shipe, the studio’s owner. “We see a lot of familiar faces each Monday morning and then the people that come end up bringing their friends,” Shipe said, adding that local hotels also support the program and recommend the free yoga classes to their guests. Hosting classes in the morning allows for participants to enjoy the outdoors before the summer heat and humidity become stifling. Having the new class on Sunday nights in August and September should also ensure comfortable conditions. “I don’t know why it took us this long to think of [doing Sunday yoga classes],” said Shipe. Hosting the classes by the sound of running water, she said, makes them extra relaxing. Monday sessions are focused on Vinyasa Flow classes for all levels. Sunday night yoga classes, however, will each have different themes. This past Sunday’s event was “Glow Yoga” where people brought glow sticks and wore reflective clothes. Around 30 people showed up, which, according to Shipe, is the highest attendance ever seen at one of these yoga events. The themes for the next few Sundays vary. On August 13, the theme is “Family Yoga Night,” where parents can bring their children for a laid-back, unscripted class. The following class, on August 20, is “Downward Dog Yoga” where participants are encouraged to bring their dogs. The last Sunday of the month will be “Relaxing Night Flow” which will be more of a restorative class. 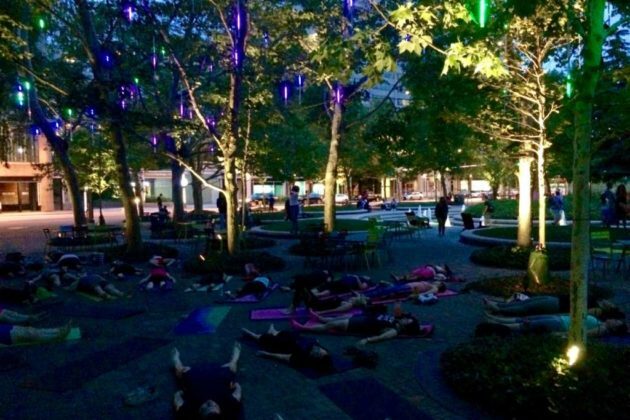 Angela Fox, the president and CEO of the Crystal City BID, said “Yoga at the Fountain” will continue to take place on Sunday nights next year, from May 1 through September 30. Courtesy photos. Disclosure: The Crystal City BID is an ARLnow.com advertiser.